back in august i bought several kilos of plums. some were made into plum and bay jam (which we are still working our way through) and the rest were been turned into a boozy delight that we have just sampled – plums in orange-spiced calvados. the mix of plums and calvados is a little unorthodox but given apples and plums are both autumnal fruits i thought the combination would work well. and it has. the richness of the calvados is balanced well by the intense plum flavours and lifted by the orange and spices. british plums are no longer in season but this would be a lovely thing to have on hand over christmas. we had the plums with orange custards but i think the next batch will be served with a still-warm sponge or polenta cake and cream. in a large pan, gently heat the calvados, sugar, water, orange zest and cinnamon until the sugar dissolves completely. increase the heat and simmer for a few minutes. 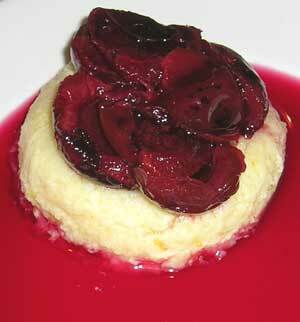 add the washed plums and simmer for 5 minutes, when the plums will be starting to soften. remove from the heat and place in a sterilised jar, making sure the plums are completely covered. leave for at least 2 weeks – i stored mine in the fridge. when ready to eat, strain the plums and discard the orange peel, cinnamon and plum stones.